Airtel, one of the networks that has earlier launched the previous versions of the iPhone in India, has again tagged itself with Apple, and has brought the latest version, i.e. the Apple iPhone 4S into the Indian market, and this could possibly be the most expensive smartphone in India right now. The prices are insane, and we are unsure which target audience has Airtel and Apple set in India, with such price tags, against which some better smartphones are available at half the prices, without any contracts or postpaid plans. The iPhone 4S is priced at Rs. 44500 for the 16GB version, and Rs. 50900 for the 32GB version, the prices being pretty higher than the previous versions of the phones of the same storage capacity. 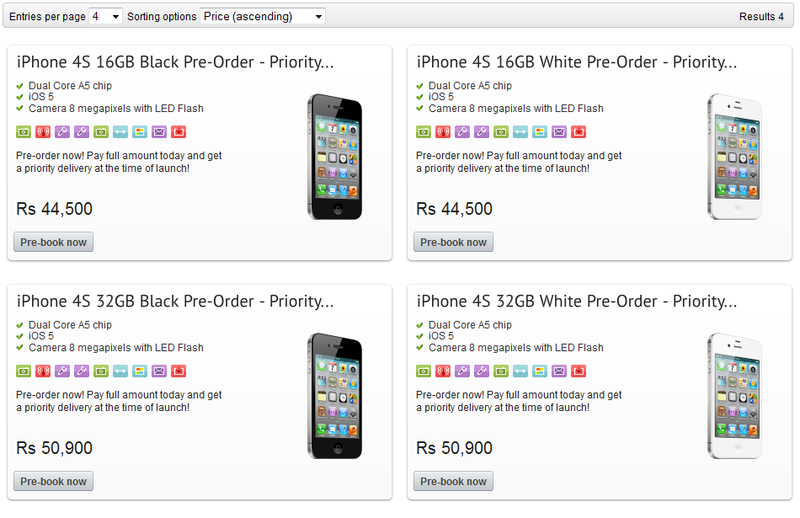 Earlier, Airtel broke the records of insanity by keeping the iPhone 4S 64GB for sale at Rs. 57500 but unsure of the reason, they removed it later on and now the users get an option of pre-ordering either the 16GB or 32GB version of the iPhone 4S. November 25th is the date when the actual launch of the iPhone 4S would happen, and till then the Airtel site has the pre-ordering available, and just like last year, Airtel and Aircel are the two companies which would be bringing the iPhone into the Indian market. The iPhone 4S would be available in both the white and black versions. The Apple iPhone 4S is one of the most sold devices lately, with 1 million sales in just a weekend, but that doesn’t affect the Indian market at all where the prices are sky high. I will buy iphone 4gs.